I'm going to get started on adding uPDI support to my autoprogrammer. What is a good uPDI chip to order for messing around with this? I saw the ATTINY817-XMINI-ND, but I'm not sure it has a 6 pin uPDI connector on it or if its SPI connector can be configured to be a 6 pin uPDI connector. Are there any DIP uPDI's ? Are there any flash >64K uPDIs? It doesn't; can perform the mEDBG UPDI disconnect procedure and connect to J201-2. Are there any DIP uPDI's ? Are there any flash >64K uPDIs? Unified memory addresses are 16b for 1-series AVR. I'm using a tiny1614 (14 pin SOIC) mounted on an adapter for my UPDI experiments. 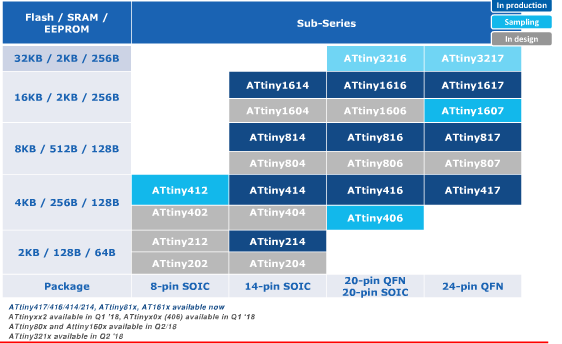 I saw the ATTINY817-XMINI-ND, but I'm not sure it has a 6 pin uPDI connector on it or if its SPI connector can be configured to be a 6 pin uPDI connector. The 6-pin 'ISP'-style header isn't usable for programming the device, as the first reply mentioned. However, the 817's PA0/Reset/UPDI pin can be disconnected from the mEDBG chip by removing the zero-ohm resistor R203. PA0 is then available on a pad in the middle of the board. I've been using this exact set up to add UPDI support to my WiFi AVR programmer's firmware, along with some additional patches to avrdude to add UPDI support to the jtagmkII/dragon protocol. Have you hooked a 'scope up to the UPDI pin while programming? The UPDI signal coming back from the '817 on my Xplained mini board during UPDI communication look like it needs a bus-keeper on the host side. The signal is driven to the required value but then it looks like the driver is tri-stated. Not sure if I have a faulty board or if UPDI really does need a bus-keeper on the programmer. 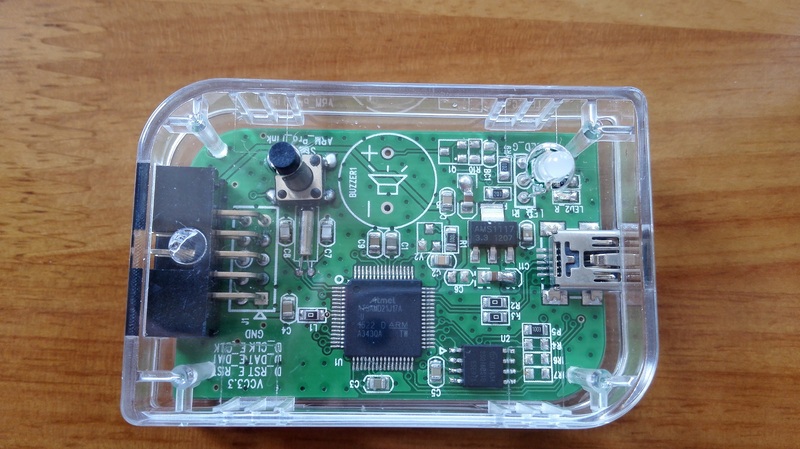 The UPDI pin has no pull-up on the XPlained board, but there is one on the wAVR programmer. See attached scope trace. The first part of the waveform is from the '817 and is the result of reading UPDI.CTRLA. You can clearly see when the 817's driver is on/off. The second is the start of a SYNCH character from my side. With UPDI baud rate set to 115200, the bits are short enough that the low-level stays below the threshold but I imagine it wouldn't work much slower than that. 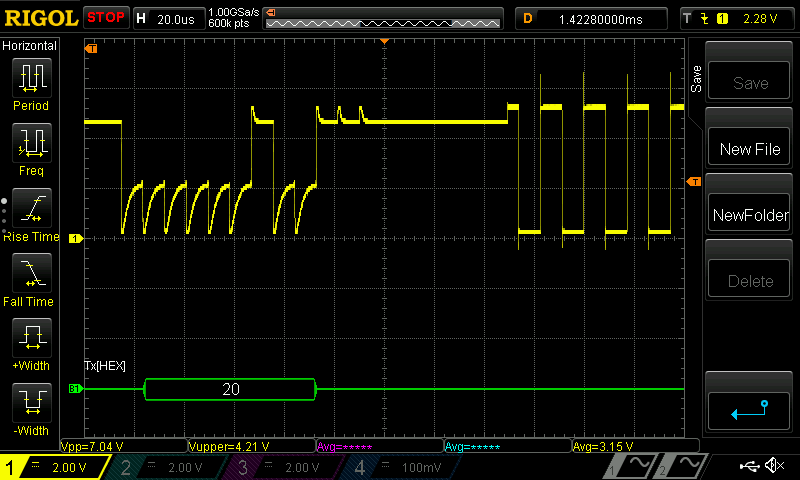 This is with Vcc = 5v. I haven't yet tried at 3.3v. The UPDI signal coming back from the '817 on my Xplained mini board during UPDI communication look like it needs a bus-keeper on the host side. On my 817Xplained board I put a 22k resistor connected from that PA0 pad to VCC when I was playing with uPDI. I must have got that value from somewhere. Changing the pull-up value from 47K to 1M fixes the issue, despite the data sheet (section 34.8) specifying the /reset pull-up to be min 20K, max 60K. Can't find any mention of pull-up values when using UPDI. Seems you need to disable collision detection (UPDI.CTRLB.CCDETDIS). 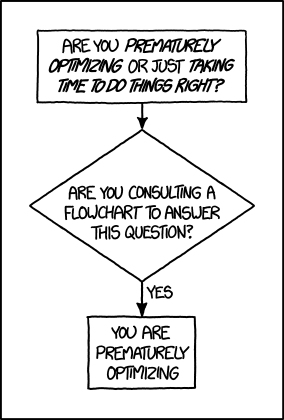 Yup, I noticed this issue some time ago. You can either disable collision detection, or deactivate whatever pull-up resistor is pulling the signal (if possible). 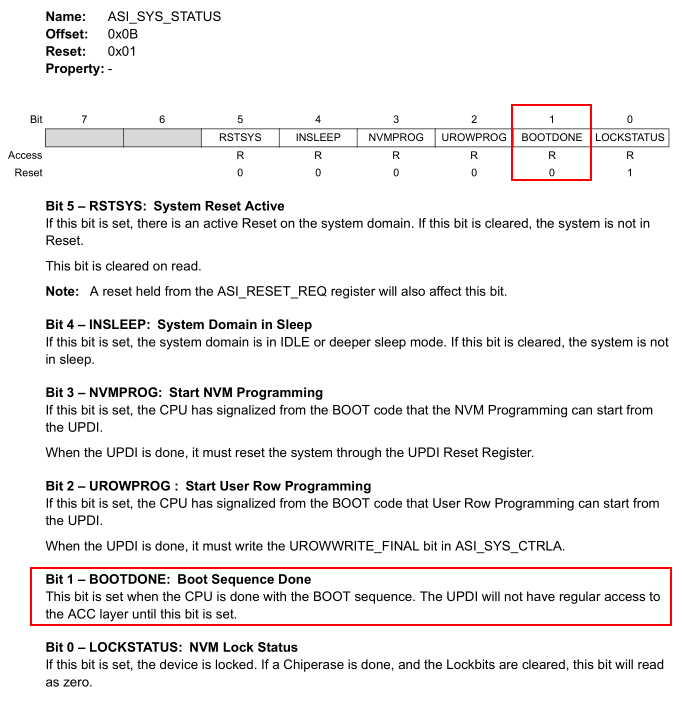 This datasheet has some extra information compared to subsequent revisions, in particular the meaning of an extra bit in the ASI_SYS_STATUS register, which is relevant for those that want to make an UPDI programmer. How to USE this autoprogramer? Connect your autoprogramer whit target chip, then Power on your autoprogramer, press the PROGRAM Key,then start download ,the res and green led stat binking,when program complish, green led will light. If you interest in this project, pls mail to me. I enable the UPDI with fuse override of RESET pin. Must the VCC pin and the UPDI/RESET pin be 5V?